The Rise, Fall, and Rise Again of Fish Oil? | Less Likely The Rise, Fall, and Rise Again of Fish Oil? A look at fish oil's controversial evidence base and how a recently completed trial fits in with all of that. The Rise, Fall, and Rise Again of Fish Oil? With the exception of this past week, it hasn’t been a very good year for fish oil. In early 2018, a large meta-analysis and systematic review of several randomized trials was published in JAMA. This large pooled analysis (77,000 + participants) assessed the impact of supplementing fish oil on cardiovascular disease events and found that there was no statistically significant effect (p=.10). The relative risks (RR) and coverage of the confidence intervals (CI) also suggested a very small effect (RR: 0.97, 95% CI: 0.93 to 1.01) for any major vascular event. A few months later Cochrane came out with their own systematic review and meta-analysis which was more comprehensive (79 studies, 112,000 participants) than the JAMA meta-analysis but also came to very similar conclusions of there being a small effect for several outcomes. At this time, it wasn’t looking particularly good for fish oil. Science-Based Medicine wrote an article titled, “No Benefit from Fish Oil,” which largely suggested that fish oil had little utility based on the 2018 meta-analyses. While these two recent meta-analyses of fish oil were very comprehensive, they weren’t able to include the results of two trials (STRENGTH & REDUCE-IT) that were using extremely high doses of fish oil (3-4 g/d) because those trials were still ongoing, and the data were not available. A few days ago, Amarin (the manufacturer of the patented, high-dose, purified EPA product, Vascepa) made an announcement that the results from the REDUCE-IT trial suggested a fairly notable reduction in CVD events (25% reduction in the relative risk, apparently, RR: 0.75, p<0.001). Several reports of this announcement declared it as a major event in the field of cardiology, comparable to the significance of statins. Of course, many folks (including myself) are still skeptical and will remain so until the results are published. For those who are unaware, fish oil has had one of the most interesting histories of all nutritional supplements that are available today. I’ve used this timeline before in a previous blog post but have updated it to include the newer events/studies. 1970s | A group of explorers noticed that people who consumed fish also had lower incidences of heart disease. 2016 | The American Heart Association creates a scientific advisory group to look at all the evidence and concludes that despite the controversy, there was a small benefit from fish oil and it could be worth it for people who had a history of CVD events. 2018 | Large meta-analysis published in JAMA with 77,000 + participants found no benefit from fish oil supplementation on real clinical endpoints. Mid - 2018 | Most comprehensive meta-analysis and systematic review with 112,000 participants by Cochrane finds very small benefits to several CVD-related outcomes. 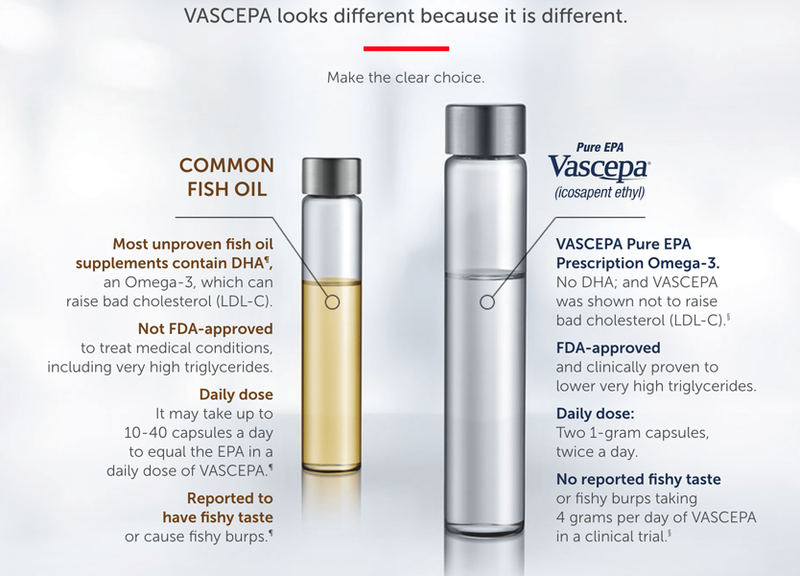 Late 2018 | Announcement by the manufacturer of Vascepa exclaiming that high-doses of fish oil in the REDUCE-IT trial had a large effect (25% reduction) on CVD outcomes. Fish oil was accompanied by a lot of hype in the early days and little evidence, but eventually, like most things, it took a beating once several research groups started prodding the existing evidence. The results of this trial (when they are presented in November at the AHA conference) and when they are published in a peer-reviewed journal, may potentially change the minds of skeptics everywhere. That’s why I thought it would be a good time to review the preregistration protocol of the REDUCE-IT trial on ClinicalTrials.gov and a detailed paper that describes the rationale behind the study design. Let’s get into it. “AMR101 (icosapent ethyl [ethyl-EPA]) is a highly purified ethyl ester of eicosapentaenoic acid (EPA) being developed by Amarin Pharma Inc. for the treatment of hypertriglyceridemia. “It is worth noting that the promising results from JELIS occurred with a high‐purity EPA preparation dosed at 1.8 g/d in a Japanese population, for whom the baseline EPA levels are higher than in western populations due to greater dietary intake of marine omega‐3 fatty acids. Icosapent ethyl 12‐week dosing at 4 g/d in a high‐risk population similar to that within the Reduction of Cardiovascular Events with Icosapent Ethyl–Intervention Trial (REDUCE‐IT) who had persistent elevations of TG after treatment with statins resulted in significant reductions in TG and atherogenic lipoproteins, as well as comparable plasma EPA levels as the 1.8 g/d dosing group in JELIS. Also “worth noting” that the JELIS trial was included in both meta-analyses mentioned at the beginning of the blog post. The primary outcome is a composite endpoint that consists of CV death, MI, stroke, coronary revascularization, and hospitalization for unstable angina. Whenever I hear composite endpoint, I often become skeptical because I’ve seen composite endpoints abused or misused in several ways, resulting in very misleading results. There was a very nice post on composite endpoints by Hilda Bastian here. The study (REDUCE-IT) enrolled 8,000 participants and began in 2011 and ended in 2018. “The sample‐size calculation was based on a hazard ratio assumption of 0.85. Therefore, 1612 events would be required to have approximately 90% power with a 1‐sided α‐level of 2.5% and with 2 interim analyses. This results in a total target sample size of 7990 patients. The design power calculations seem like they were based on very optimistic expectations of the effect size, and apparently, justifiably so! A bit unfortunate that there is no mention anywhere of what statistical analyses they planned on doing exactly. There’s a bunch of exclusion criteria too that I don’t really feel the need to go over, but you can see them listed out on the registry. Also, worth mentioning of course that the trial is funded by Amarin, AKA the manufacturer of Vascepa. Even though my title mentions “fish oil” it really is important to point out that this is NOT the average fish oil supplement that you’ll get over the counter. It’s a highly purified substance, that’s currently being prescribed by doctors in high dosages for hypertriglyceridemia. It is a drug. An extremely expensive one ($250+ for a 30 day supply… ) that most insurance companies will not cover unless your blood tests show an indication of high triglycerides. So, while the substance technically is fish oil, a very purified, high-dose version of it, the results of the REDUCE-IT trial are not evidence of your average fish oil supplement having these same effects. I look forward to hearing about the results of this study in November. Edit: I’ve covered that study in this blog post. Is Moderate Carbohydrate Intake the Best?